Nowadays people from every walk of life are concerned about inflation. What actually is inflation? Is it inherent in a free market economy? Who or what is the cause? Unions, government regulations, merchants, federal deficits, or middlemen? Can inflation be stopped, and how? What to do? Most people are desperately confused and searching for answers. Society is facing nothing short of a crisis. In answer to this grave situation comes Henry Hazlitt's latest book, The Inflation Crisis, and How to Resolve It. 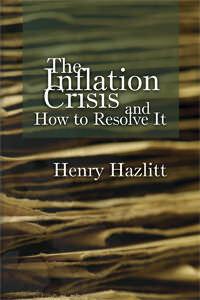 As Mr. Hazlitt himself begins the book, "no subject is so much discussed today — or so little understood — as inflation." Henry Hazlitt estimates that a dollar of today is worth less than 25 cents of a 1940 dollar, and certainly no one has to be told that a dollar continues to buy less and less. Yet, how many people realize that since 1940 the federal government has increased the money stock by well over a thousand percent? Hazlitt reports that at the end of 1939 the total number of dollars in the economy was 63.3 billion, and at the end of 1977 that figure stood at 806.5 billion. Anyone who is aware of these events should surely sense a logical connection between constantly rising prices and a continuous expansion of the money supply. Mr. Hazlitt points out that there are two sides to every price. A price is an exchange ratio between a dollar and a unit of goods. When people have more dollars, they value each dollar less. Goods then rise in price, not because goods are scarcer than before, but because dollars are more abundant, and thus less valued. He clearly explains that the present predicament of ever-soaring prices results from a deliberate government policy to flood the economy with more and more dollars simply by "printing" them. In fact, the term inflation originally meant increasing (inflating) the money supply. Today the term is commonly used to mean the most evident consequence of creating money, generally rising prices. So, nothing at all is mysterious about inflation; it is government intervention pure and simple. Why, then, do government leaders continue to inflate and why do the printing presses go undetected by the general public? Inflation serves the immediate interests of vote-seeking politicians. Most office seekers promise scores of handouts in return for being elected, but the federal budget has become so ominous that financing by direct taxation is politically impossible. The federal government resorts to printing money to help cover any deficits, and that is done in a very complicated way through the Federal Reserve and commercial banking system so as to hide the process from most people. Henry Hazlitt devotes a great deal of The Inflation Crisis to discussing government spending, deficit financing, and the fallacies in general of a government-managed monetary system. In addition, he explains the benefits of a market determined gold standard. His text ranges from presenting simple principles of money and inflation to refuting sophisticated Keynsesian doctrines, especially the notion that monetary expansion is necessary to employ idle workers and resources. Equally important, Hazlitt analyzes policies of monetarists, generally led by Chicago School economist Milton Friedman. The distinction between monetarists and other advocates of free enterprise is often muffled. Henry Hazlitt makes plain that monetarists are inflationists, who advocate a certain annual rate of monetary expansion by government officials. The central flaw of the Monetarist proposal is its extreme political naiveté. It puts the power of controlling the quantity, the quality, and the purchasing power of our money entirely in the hands of the State, that is, of the politicians and bureaucrats in office. A consistent free market economist, on the other hand, would argue to let individuals, voluntarily acting in the marketplace, choose which commodity they will accept as money. Hazlitt cautions about using false remedies to combat inflation. Attacking rising prices with wage and price controls misses totally the heart of the problem. They do nothing to halt the monetary expansion. Moreover, the controls themselves have the disastrous consequences of creating shortages, discouraging production, and moving ever in the direction of a complete command economy. Mr. Hazlitt also explains how inflation disrupts production, inhibits economic calculation, distorts interest rates, malemploys workers and resources, and consumes capital. Just as serious as the economic disruption are the social consequences of inflation. It destroys thrift, promotes gambling, disheartens the spirit to work, and breeds social unrest, envy, and crime. "Just as serious as the economic disruption are the social consequences of inflation." Under inflation … only a handful of people realize clearly what is going on. The majority tend to blame their plight, not on government, but on those of their neighbors who appear to be profiteering from inflation. A major part of the solution … will be how to get the monetary system out of the hands of politicians. Certainly as long as we retain our nearly omnipotent redistributive State, no sound currency will be possible. This review first appeared in the Freeman, Vol. 28, No. 10, 1978, pp. 638–640.